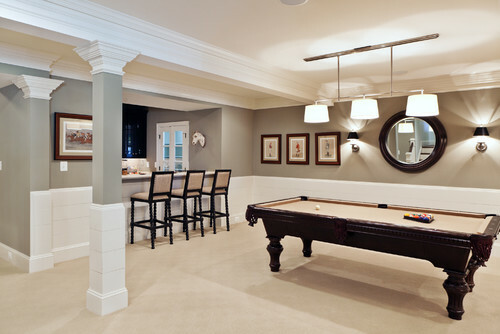 Need more space in your home, Why not renovate your basement and make it the new family room. Low ceilings, leaky stone foundation, hanging wires and structural poles can always put a burden on your renovation, and might make you feel that it is impossible renovate. But say good bye to your doubts and fears. There are number of ways to disguise these issues. Drywall ceilings and walls makes the Space look closed in; smaller. Plus, dry-walling in front of foundation walls trap’s moisture. Avoid this. “Painting the ceiling dark makes a huge difference psychologically” Black painted rafters, ductwork and beams create the illusion of higher ceilings. Crown Molding are usually a good to visual to open up elegance in a basement. This refreshes the space and proves that the basement is not dark and dirty, a coat of paint can make all the difference. Even a small basement can be put to good use. Fill it up with cozy and soft colors, as in this room, and you have a dedicated family space. The wood adds to a to the rooms as well. 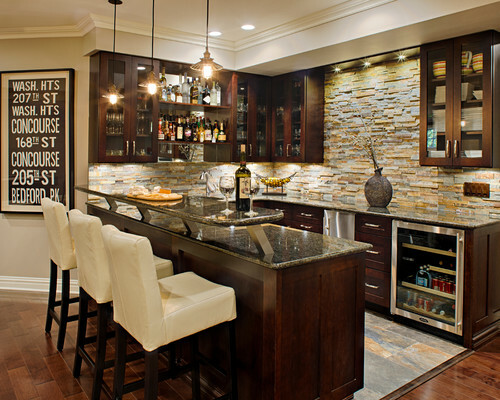 Check out this wooden Bar! 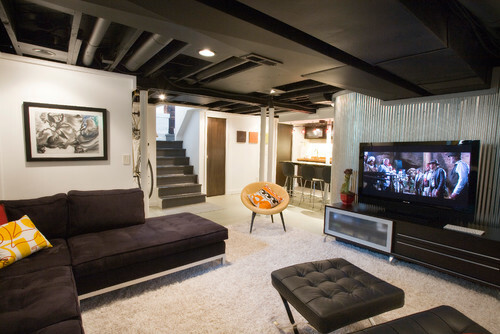 If you have any kool basement ideas, feel free to share it with us.